"Battle isn’t about Gaza, but rather, about radical Islam vs. liberal West" - Bar-Ilan Univ professor Mordechai Kedar. In this exclusive video, Prof. Kedar explains how Jerusalem was made holy by Muslims for political reasons. It is clear to anyone with eyes in their head that the battle taking place off the Gaza shore is in fact a clash between an Islamist coalition which Turkey attempts to head – and which includes Iran, Hamas, and Hezbollah on one hand – and forces with a liberal Western orientation, represented by Israel, on the other hand. This fight isn’t about Gaza. The battle is about the future of the Middle East: Will it be a future where the existing political order is maintained, or will radical Islamic forces rise and replace the current order, as already happened in Lebanon and in Turkey. The time has come to tell those who live near and far that this battle is not just about the Middle East; rather, it is a fight for the face of this world. At this time, Israel is located at a frontal outpost, where it fights the war of the enlightened, liberal, pluralist, open, and democratic world – in the huge struggle against the Islamic forces that threaten to take over the world and subjugate it to their green flag. The participation of Sheikh Raed Salah, the head of the northern Islamic Movement in Israel, in this sail serves as proof that the battle is not territorial, national, or humanitarian – rather, it is a cultural-religious one. The IDF operation was meant to be the bell that may wake up the world from its stupor, so it sees the Islamic cloud that is about to cover the sun of global liberal democracy. 1. What were the motives of those on board the flotilla? Palestinian Media Watch just released this video. It's an al-Jazeera report before today's incident showing men on one of the ships chanting "Khaibar, Khaibar, oh Jews! 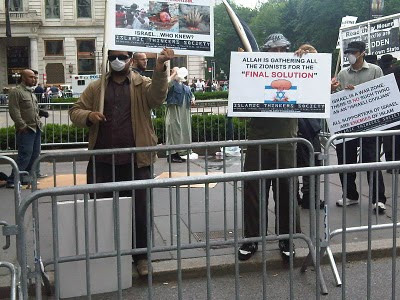 The army of Muhammad will return!" As PMW explains, "Khaibar is the name of the last Jewish village defeated by Muhammad's army in 628. Many Jews were killed in that battle, which marked the end of Jewish presence in Arabia. There are Muslims who see that as a precursor for future wars against Jews. At gatherings and rallies of extremists, this chant is often heard as a threat to Jews to expect to be defeated and killed again by Muslims." The clip also shows an interview with a woman who said the goal of the participants on the flotilla had "one of two happy endings: either martyrdom or reaching Gaza." This story reveals a group girding themselves for battle and martyrdom, not simply on a humanitarian mission. "Barbara Boxer will not stand up for Israel. But she will stand beside the President who is doing grave harm to Israel -- and to America -- so long as he fills her reelection coffers. It tells us everything we need to know about her -- and it tells us why she'll be a former Senator in January 2011. Israel is our only true ally in the Middle East -- and indeed, one of our few true friends in the world. It deserves better than the attacks it has suffered from the Obama Administration of late. More important, America deserves better. We expect our President to have a clear-eyed understanding of America's interests. Instead, Barack Obama's policy on Israel is apparently driven by petty vindictiveness, coupled with a shocking naïveté, married to an unforgivable ignorance of the Middle East. For the Administration to 'condemn' -- the strongest possible diplomatic language -- the construction of some apartments in a historically Jewish section of Jerusalem does nothing to advance the cause of peace, and still less the security of our country. Peace is advanced through strength, not weakness -- and through unity, not division. At a stroke, President Obama has diminished both. Instead, the President and the Secretary of State have only emboldened Israel and America's enemies. Have no doubt that Iran, Syria, and Islamist radicals around the world are watching America turn on its longtime ally. And they approve. Have no further doubt that our allies from Britain to Korea to Afghanistan are seeing the disregard our President has for faithful friendship to the United States -- and drawing the appropriate conclusions. The plain fact is that neither America nor Israel have ever benefitted from capitulation to pressure from their enemies -- and make no mistake, our enemies are the same. The American people understand this: that's why they overwhelmingly support our enduring friendship with Israel. Americans stand by Israel because our most sacred principles compel us. This Administration does not appear to share those principles. While Vice President Biden was chastising Israel over apartment construction, the Palestinian Authority was naming a public square after a suicide bomber who slaughtered 37 innocents. Americans instinctually grasp the difference between civilization and barbarism, and they know that a public honor for a mass murderer is perilously close to the latter. It's inexcusable that Barack Obama's Administration doesn't have the same moral sense. I said the time is come to speak out -- and that's not just true for me. I've been speaking out since I entered public life over twenty years ago. I have a long record supporting Israel in public and private. Decades ago, I worked to secure U.S. funding for the Arrow antiballistic missile system, which is today a critical component of Israel's self-defense. I also worked in Reagan's Defense Department on defeating the Iranian threat of the 1980s. My experience in the Middle East -- academic, professional, and personal -- is longstanding and consistently pro-Israel. The President of the United States has no such record, and he's not creating one now. In the short run, we must demand that Senator Barbara Boxer stand up for America's interest in the alliance with Israel. She must oppose Barack Obama's ruinous and shortsighted attack on our ally. She has yet to utter a word in Israel's defense, and it is to her discredit. And in the long run, we must elect a United States Senator from California who won't need to be reminded where duty and American interests lie. I am a candidate for this office for that very reason -- and when I am in the U.S. Senate, I will stand strong for America and Israel, where the incumbent and our President do not." (ABC News by Simon McGregor-Wood) Religious nationalist Jews got wind of the Zach Emanuel bar mitzvah trip, due to take place next week, and warned Emanuel they would "blow up" the celebration. They accuse Emanuel of being behind President Obama's tough stance against Jewish settlements in occupied territory. Itamar Ben Gvir and Baruch Marzel wrote to Emanuel: "We promise to accompany your son's bar mitzvah events in Israel, we will make sure to receive you as you deserve to be received ... with catcalls and disgust." Ben Gvir and Marzel have reportedly offered to take the teenager "on a day of fun without his father, in which we will hold a jeep tour in the various heritage sites of the Jewish people such as the Western Wall, the Tomb of the Patriarchs and Joseph's Tomb. We can only hope he will return to his father and teach him a few things about the Jewish peoples' heritage." (Story by Robert Berger for CBS News JERUSALEM) -- White House Chief of Staff Rahm Emanuel got a hot welcome to Jerusalem's Old City Thursday. Arriving to celebrate his son's Bar Mitzvah, President Obama's right-hand-man was heckled by nationalist Israeli activist Itamar Ben-Gvir. "You are an anti-Semite, a hypocrite who hates Israel!" Mr. Ben-Gvir shouted. "You want Israel to return to the 1967 borders. Shame on you!" Many Israelis feel betrayed by Emanuel, whose father is Israeli. They blame him for what they see as President Obama's anti-Israel policy. Ties between Israel and the U.S. have plummeted since Mr. Obama took office last year. ... This has created the popular perception here that Mr. Obama, and Emanuel, are selling Israel out to appease the Arab world. Even though Emanuel is on a private visit, he took some time for official business. He met with Netanyahu and issued a surprise invitation for a meeting at the White House next Tuesday. Now that peace talks have resumed after a 17-month deadlock, Israeli officials say the Obama administration is apparently interested in mending fences. Israel Day Concert following the parade featured Likud speaker, MK Danny Danon. (Courtesy Hannah - who blogs at Ink Stained Hands). 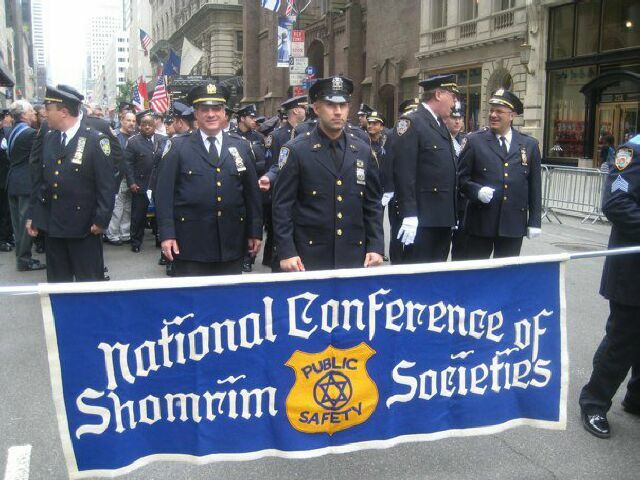 "Men, women, students, children, and dogs were all there to display their pride for Israel. Both those marching and those observing waved Israeli flags and cheered. 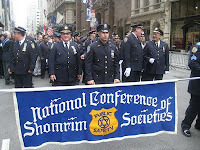 And one of the things I love most about these parades for Israel is the incredible sense of unity. 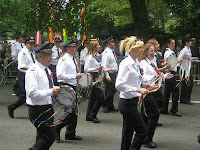 There is a connection, a special bond, between all the people who show up to the parade. It does not matter who they are or how they identify themselves -- if they are religious, non-religious, Orthodox, Conservative, wearing a kippa or bareheaded, wearing a short skirt or pants -- they are all there together to show their love for Israel and the Jewish nation. And that's beautiful. Seeing all these people -- thousands of them -- together in one place and for a common cause is beautiful. I could have cried out of pride. 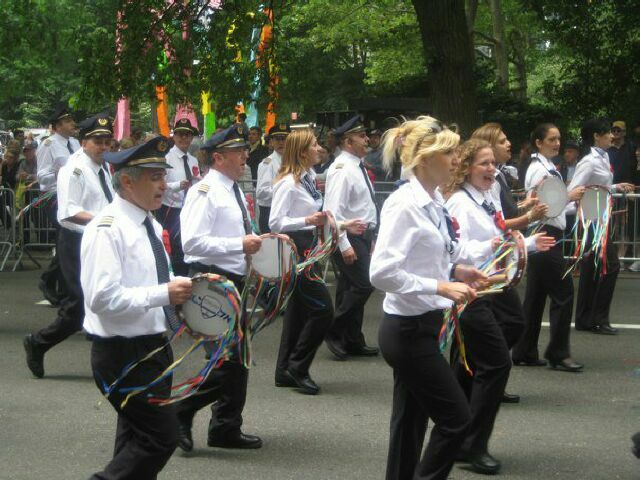 I spent a couple of hours at the parade and then made my way through Central Park to the Summerstage, where the Israel Day Concert was taking place. At that point, the sun came out full force and I felt myself baking in its heat. It cooled down eventually though, so I stayed for a while. There was music, dancing, and singing as everyone celebrated together." 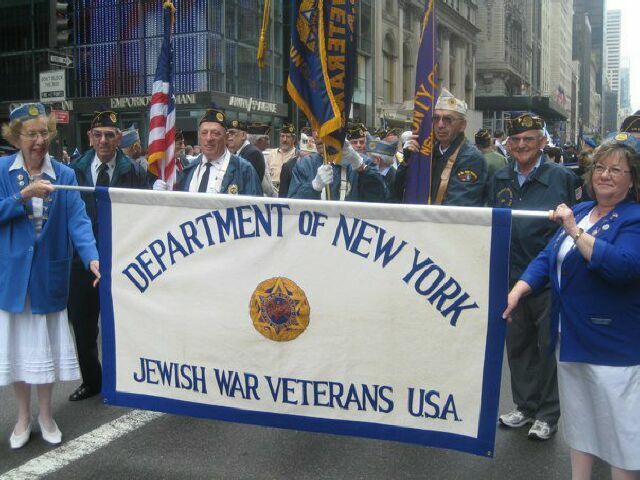 Among the groups who marched, watch the video for the (North) American Veterans of Israel (who volunteered to defend Israel from impending Muslim onslaught in the 1948 War of Independence). (Video credit: Alex Belikov, NYC). 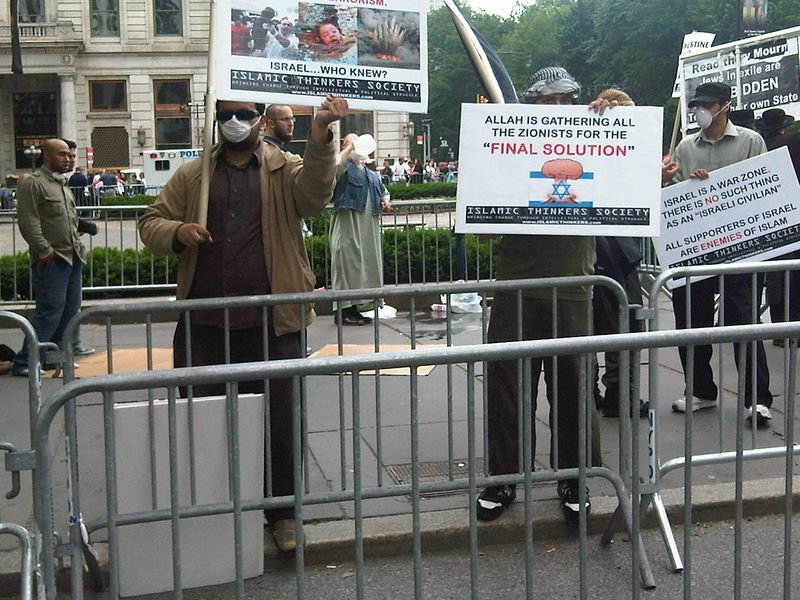 Islamic-Thinkers' Society protesters signs: "
There are 3 Jewish TV channels in the US - Jewish Life TV (which is live, linear broadcast on cable & satellite), Shalom TV, which is free cable VOD, and The Jewish Channel (which is premium VOD). Each of these has a website with streaming video. 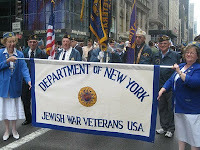 Yet, after 2 days past the completion of the Salute to Israel Day Parade & Concert, no live video or TV coverage of this parade. 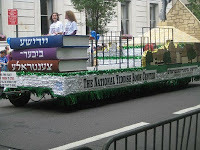 The only video dissemination of this parade were video news stories telecast by the local, NY TV news shows (for whom the parade was a backdrop to their primary interest, the announcement of Atty Gen Andrew Cuomo's candidacy for Governor). Even Israel National Radio (who live-simulcast the Concert) has no archival audio from the event available on its website. If you'd like to reinforce the message of activities l'Kovod Hashem through the media, would you please register your mitzvah by supporting the efforts of Joo-Tube? Thank you. Christian leaders at more than 1,500 churches in all 50 states and in more than 50 countries are scheduled to hold religious services Sunday May 23 focused on educating their congregants about the importance of Israel to their faith. To Rav, with love? Chasidim in inner-city public-schools offer to tikkun the system for minorities. But will ethnocentrists sabotage the opportunity? Mr. Waronker, the seventh principal in less than three years, was in the first graduating class of the New York City Leadership Academy, which was created in 2003 to groom promising principal candidates. While considered one of the stars, he was among the last to get a job, as school officials deemed him “not a fit” in a city where the tensions between blacks and Hasidic Jews that erupted in Crown Heights, Brooklyn, in 1991 are not easily forgotten. Waronker, a member of the Chabad-Lubavitch sect of Hasidic Judaism who wears a conservative suit, a beard, a black hat and a velvet yarmulke, had to overcome prejudice both in getting the job and in gaining the trust of the parents, teacher and students at the school. But at J.H.S. 22, attendance among the 670 students is above 93 percent, and some of the class offerings seem positively elite, like a new French dual-language program, one of only three in the city. “If I could clone Shimon Waronker, I would do that immediately,” Schools Chancellor Joel I. Klein said in a recent interview. In Los Angeles, a public-school teacher - "The Surfing Rabbi" Nachum Shifren - has been working to improve educational conditions in inner-city schools for years. Teaching in high-crime areas of the city, Shifren is fed-up with what he experiences as a system which pushes delinquent students upward without proper skills, a dysfunctional administrative system, and the teachers' union which protects apathetic teachers. 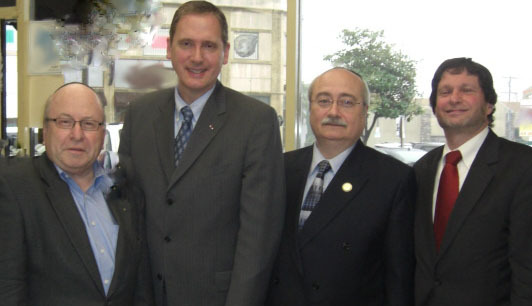 Rabbi Shifren is seeking to repair the system through election to the California State Senate. In a district which includes areas of high minority constituency (including 37% Latino) with high-crime and overused social services, Shifren seeks to garner traction for his Conservative agenda, which includes cracking-down on illegal immigrants' abuse of tax-payers' social services. Rabbi Shifren held a town-hall meeting with Jamiel Shaw, Sr., whose son Jamiel was murdered by an illegal-alien gang-member, Pedro Espinoza, now imprisoned at tax-payer expense. Rabbi Shifren is shown speaking to a multi-ethnic audience of voters- who take an interest in how the candidate might crack-down on crime and improve conditions in their schools. The Israeli Leadership Council of Los Angeles will honor Ambassador John Bolton at its annual Gala on May 12, 2010. Amb. 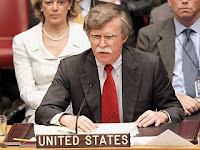 Bolton has been an outspoken critic of the Obama Administration's handling of Middle-East players, Iran (nuclear threat to the world, treated with kid gloves) and Israel (regional stabilizer and ally, treated with disdain). The I.L.C. will also honor Israeli-American activists, Naty and Debbie Saidoff, for their dedication at this year's event.